The Villa del Tellaro is an off-the-beaten-path site in Sicily, though easily accessible from Noto or Syracuse if you have your own transport, or if you join a guided walking tour of Sicily with Italian Connection. The Roman floor mosaics at the Villa del Tellaro may not be the most extensive in Sicily, but they are exquisite. Unlike its more famous cousin the Villa del Casale near Pizza Armerina, the Villa del Tellaro has the advantage of being much easier to reach, just a few kilometers south of Noto. And this being a less-visited archeological site, you may also be blessed with having the place to yourself, enjoying the quiet setting amidst lemon groves. It helps to know some Italian or read up ahead of time because all the brief explanations are in Italian. (We visit the Villa del Tellaro on several of our walking tours in Sicily, where you can gain a more intimate knowledge of these Roman mosaics through your guide.) But for the moment, let’s explore vicariously. The Villa del Tellaro (named in recent times due to its proximity to the Tellaro river) is fairly typical of the country villas that were often used as hunting lodges in Roman times. Originally a sprawling complex of 6000 square meters with a peristyle, or internal courtyard bordered by a columned portico, part of the mosaic floor of the portico remains, along with the floors of 3 adjacent rooms. The largest mosaic is filled with scenes of hunting and animal transport, seamlessly intertwined with a delightful banquet scene with eager dogs ready to lap up any leftovers. 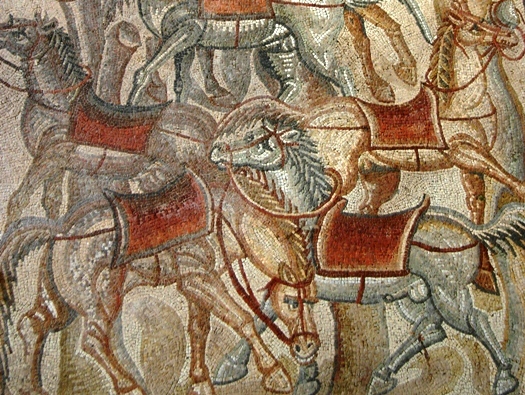 The subtlety and movement in the mosaics shows exceptional skill, and is achieved by the use of very small tesserae, the tiny cubes of cut stone in a range of natural colors. 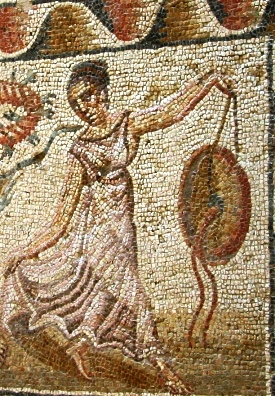 In one mosaic, there is an image of a Satyr chasing after a menade, a passionate young woman often depicted in Greek mythology wearing a transparent gown, a difficult effect that is beautifully achieved in this mosaic. The Villa del Tellaro’s origins date back to the 4th century AD, and it was destroyed by a fire about 100 years later. Forgotten about for centuries, someone decided to plunk a 17th century farmhouse on the remains of the villa, so parts of the excavation include the farm’s wine-making vats. An illustration shows the various phases of the villa and farmhouse building, but most of the original villa has been lost, or yet to be excavated. The mosaics have been restored and covered with a modern roof, so don’t expect to see an antique structure, though some parts of the Roman walls are still visible. 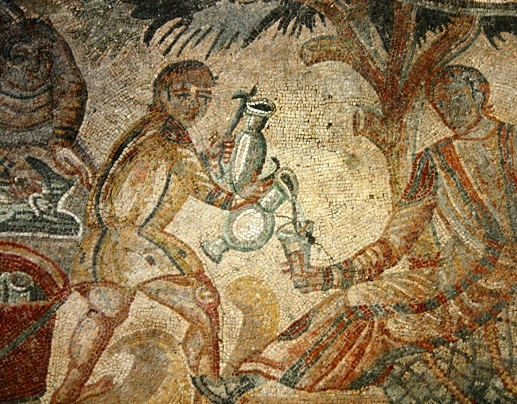 In the early 1970’s, the abandoned farmhouse was subject to illegal excavations, and some of the mosaics were stolen and never recovered. As often happens when the Soprintendenza of the Arts steps in, time slows to a crawl, and after numerous bureaucratic snafus and the unexplained disappearance and reappearance of the remaining mosaics, the villa with its restored mosaics was finally opened to the public in 2008. Ongoing excavations have turned up Roman cisterns and medieval tombs, so who knows what else may lurk beneath the surface of this evocative site. As of March, 2019, the Villa del Tellaro has free admission, and is open every day, though this could change at any time. Such is life in Sicily!